The case of the murder of Lucy Derrick by a man called Edward Smart or Saunders excited much attention in Thornbury in 1879. Neither the victim nor the perpetrator came from Thornbury. We have decided to give the details because they involve local witnesses, magistrates and policemen and because the trial shows a great deal about the justice system operating at this time, and the horrors of execution by hanging, a totally abhorrent means of execution that remained the sentence for murder until 1998, and actually employed as a means of capital punishment up to 1964. 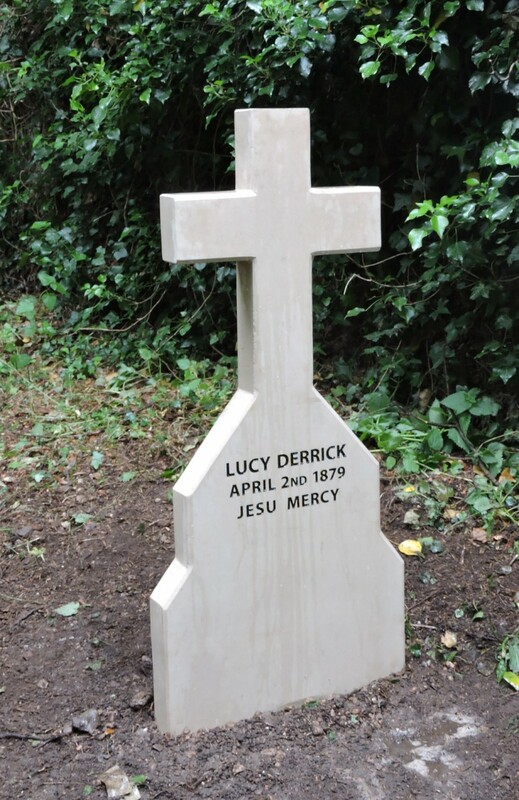 Lucy Derrick, sadly, played a minor role in the reports of the murder and the fact that a totally innocent and seemingly very vulnerable young woman lost her life seems to have been sidelined in the gruesome newspaper accounts of knives, razor, hammer and blood. The reports of Lucy’s age vary from 32 to 37. We do know that her parents were both dead and she had few relatives and no friends. We have been unable to trace her definitely in the censuses, although she may have been living with her sister and widowed father Thomas, an agricultural labourer, in Blagdon in Somerset in the 1861 Census. The Belfast Newsletter says she was a domestic servant from Yatton in Somerset who was walking to Gloucester to meet her young man. It seems that Lucy had once been a servant in the employ of Mr William Burge of North End Farm but had left his service two years before. She had failed to find any regular employment and was said to be of “weak intellect.” She had formed an attachment to Jacob Needs some two or three years older than herself who lived with his mother at Horse Castle in Yatton and she became known locally as Jacob’s “wife.” Jacob Needs was in the militia and had had to go to Gloucester for training. Her response to this was that she would make her way to Gloucester and try to find employment there so that she could be near him. She had last been seen with Needs in a public house in Yatton when she bought him a beer and some biscuits. At that time she had with her a brown paper parcel with what remained of her wearing apparel, after selling most of it to meet the expenses she would incur on her trip. She left Yatton some time on the Tuesday and was seen the following morning (Wednesday 2nd April 1879) at Thornbury. She called into the Boar’s Head in Thornbury for a glass of beer. The publican there said she was respectably dressed and talked in a manner decidedly superior to that of a labourer’s or artisan’s wife. Apparently she had said she had been living with her mother in law but was now on her way to join her husband who had obtained work in Gloucester. Lucy fell asleep before she had even finished her glass of beer and the landlord let her rest there for a couple of hours. Lucy’s death was sad in many ways, apart from the horror of it. Her body was identified at the Thornbury Union Workhouse by her uncle William Cooksley who was a labourer from Blagdon so it seems that she did have some relations. However her body was never taken “home”, wherever that would be for Lucy. She was buried in a plain coffin at Thornbury. There were no family or friends to serve as mourners at her funeral but a large crowd of onlookers. The burial service was read by Rev T Waters. Her grave is still visible in St Mary’s Churchyard in Thornbury today. Edward Smart or Saunders, the perpetrator of the crime, seems almost as unfortunate in some ways as his victim. He was quite obviously mentally ill. The descriptions of him make him seem a nice young man to look at – the newspapers say that he was short and fair with a pleasant countenance and he seems to have been quite well dressed. The Belfast Newsletter gave some background to his life and said that he had been in prison twice for convictions relating to arson and that he had only left prison in January. It seems Edward was the illegitimate son of Mrs Elizabeth Hitchman who kept a lodging house in Brighton. He was born in Marylebone in London and spent his early years in that city. He travelled to Pucklechurch where he worked for two or three years for Joseph Bennet a general shopkeeper in Pucklechurch before returning to London. He gave up his work as a paper maker there and went to Buckinghamshire where he set fire to a hayrick and then gave himself up to the police. He was tried at Aylsbury for arson on 10th March 1865 and sentenced to six years penal servitude. He was released on 10th March 1870 and in August of that year he was again tried for arson. When he came out of prison for a second time he went to stay with his aunt Mrs Julia Short of 7 Cambridge Street in Totterdown. Her husband was an engine driver. He had left his uncle’s house early in the morning with a razor, a hammer and two knives. He then walked to Thornbury, where he saw two young girls with perambulators containing the children of Mr. Stafford Howard, M.P. They were standing outside the gate of his residence, Thornbury Castle. Edward made up his mind to murder them but, as he was nearing them, some people came in sight, and he walked on. At Morton he went to the home of a Mr Penduck and asked a woman there for a drink of water. He had an impulse to kill her but there were several children playing about and he thought they would raise the alarm. Soon afterwards, he met Lucy Derrick, or rather he slackened his pace in order that she might overtake him. The reports say that PC Nathaniel Westaway saw Edward on Wednesday April 2nd while he (PC Westaway) was on duty at Morton. Fifteen or twenty yards behind him was Lucy and the pair were walking slowly at the same pace. PC Westawy assumed that they were travelling together. The attack and murder took place near Pit Pool at Upper Moreton a mile from Thornbury. 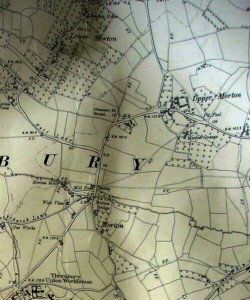 On the left we have an image taken from a map of 1903 that shows where Pit Pool was. Mr Charles Cox of Ithells Mills Kingswood near Charfield was a traveller in the flock trade. As he approached Pit Pool his horse began snorting, presumably because it could smell blood. He saw the woman lying on a heap of stones at the side of the road and with a man sitting next to her. Mr. Cox asked the man what he had done, and he replied, ” Murdered a woman”. Mr. Cox asked him why, and he said he did not know. Mr Cox said he would go for help and drove back into Thornbury. He sent a road man who was sitting on the side of the road to keep an eye on Edward. It emerged from evidence at the trial that this road man was an elderly man called William Till who lived at Crossways. Charles Cox then found a policeman and told him what he had seen. The next time he saw the man he was in the company of Superintendent Critchley. When Mr Critchley drove up to apprehend him, and was getting down, the prisoner said he need not trouble, he would get up; and he did, at once beginning a conversation about the deceased, asking the officer if he knew her, and then descanting on the qualities of the horse. He also pointed out the parcel that the woman had dropped when she was attacked. Lucy’s body was taken into the Anchor Inn at Morton and then to the Thornbury Union Workhouse. The post mortem was conducted by Thomas Henry Taylor a surgeon who practised at Thornbury. He found five contused wounds on her head, caused by the hammer. Her throat was cut almost to her spine and the muscles of her neck and windpipe were completely severed. It looked as though the knife that was used was not sharp enough and the accused had to finish the job with the razor. Lucy was buried in a quiet corner of the churchyard at St Marys Church on 8th April 1879. We do not know who paid for the headstone shown in the photograph near the top of this page. In 2017 there was concern that the stone was deteriorating and its inscription lost forever. Thornbury and District Museum, with funding and assistance from Thornbury Town Council, arranged for the restoration of the stone and its inscription. The image on the right below shows the results of their combined efforts. Dr Grace examined Edward and found him quite sane apart from “his love of prison life”. On Tuesday April 7th Edward Smart, otherwise Edward Saunders, appeared at the Police Court in the High Street in Thornbury. The magistrates were Messrs W. Osborne Maclaine, and Edward Harwood. The court was crowded and there was great interest and excitement in the town. Mr Lloyd was clerk to the magistrates and he read the charge. Edward was wearing a light brown coat, black waistcoat, paid trousers, blue check shirt and blue stockings. The boots he had been wearing at the scene of the crime had been taken away for evidence and so he had to wear slippers. He was committed for trial at the Spring Assizes. Meanwhile he was held at Gloucester Gaol. The grand jury deliberated for an hour before they found a true bill against Edward Smart otherwise Saunders indicted for the wilful murder of Lucy Derrick at Thornbury. The jury recommended him for mercy. The judge said that in view of the extraordinary atrocity of the murder he could only pass a death sentence. The recommendations of the jury would be sent to the proper authorities but the prisoner was not to hold out any hope that his sentence would be mitigated. On 28th April 1879 it was reported in the press that a petition had been sent to the Home Secretary praying for remission of the extreme penalty. The following day a letter appeared in newspapers from Mr Clifton, the solicitor who appeared in Edward’s defence. It outlined his medical history and alarming behaviour and appealed for clemency as his client was obviously insane. He also pointed out that the prisoner’s friends were very poor and could hardly afford to pay for the solicitor to go to Worcester and so they could not afford the expenses that would have had to be paid to witnesses for the defence. On the Saturday, Mr. Clifton received a communication that the Right Hon. Gentleman saw no reason to prevent the law taking its course. The next day the Chaplain administered Holy Communion to the culprit; in the evening Smart spent some time reading the Bible and ate a good supper before retiring to bed. Just after seven in the morning, the Under Sheriff entered the cell and claimed the body in the usual legal form. Then the group made their way to the scaffold. At least one account describes Marwood, the executioner in some detail. Apparently he was a rather short, middle-aged man attired in pepper and salt trousers and waistcoat, black jacket and bowler; a noticeable adornment of his attire being a massive Albert chain. The Chaplain continued reading the burial service, but no sooner was the culprit on the platform than Marwood rapidly proceeded with his work. The noose was slipped around his neck, then he took from his pocket a white cap which he put over the culprit’s face. While the Chaplain was reading a prayer, Marwood went to the back of the gallows where he hit the handle of a lever and in an instant the platform fell in with a crash and the prisoner dropped into a pit below. It was later found that although Marwood had given the prisoner a drop of 9 feet the neck of the culprit was not broken. This was said to be due to the fact that the metal ring sent down from the Home Office prevented the noose from fitting quite close to the neck. It seems that Edward suffered for at least two or three minutes after the drop and that he died from suffocation. The post mortem said that Edward had an unusually thick neck and this was another factor in its not being dislocated.